Here's an instance of NFC technology that's more exciting than yet another tap-to-pay scenario. 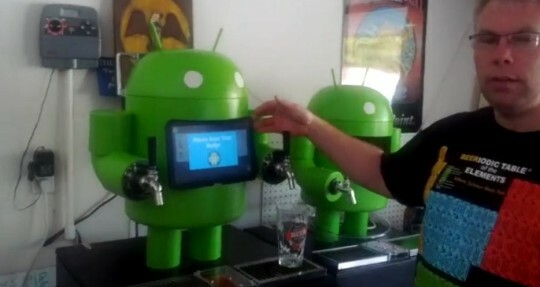 Google employee Paul Carff combined a Motorola Xoom running ICS with an Arduino microcontroller to create KegDroid, a friendly green beer dispenser. The Xoom acts as a gatekeeper to that brewed goodness, only letting the bot dispense drinks after users swipe an authorized badge. The badge is read by an NFC scanner on the bottom of the case and is then authenticated (or rejected) by the Arduino board. Once the system grants access, users can choose from two selections on tap via a custom Android application displayed on the Xoom's screen. As Android Community points out -- and as you'll see in the video below -- the KegDroid hasn't mastered a bartender-level pour (read: there's way too much foam). Still, this is oodles cooler than your average keg, wouldn't you agree? 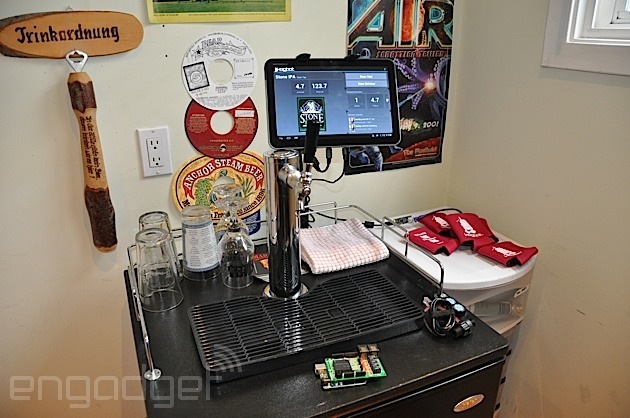 KegDroid dispenses beer with the help of a Xoom tablet and an Arduino board originally appeared on Engadget on Mon, 30 Apr 2012 17:47:00 EST. Please see our terms for use of feeds.